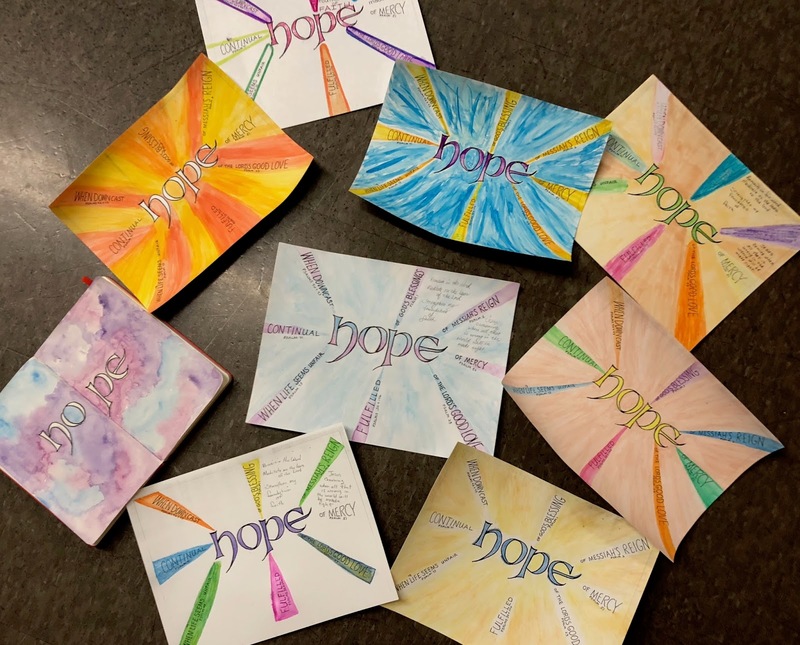 Our Visual Faith Community - Metro Detroit met this past weekend for our once-a-month study. 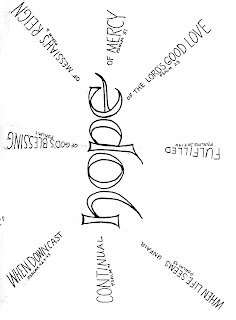 For the next 4 mounts we will be using the book "Discovering Hope in the Psalms" as our guide. We review 2 chapters each month, then complete a couple of projects. The images below depict the projects we did this month. 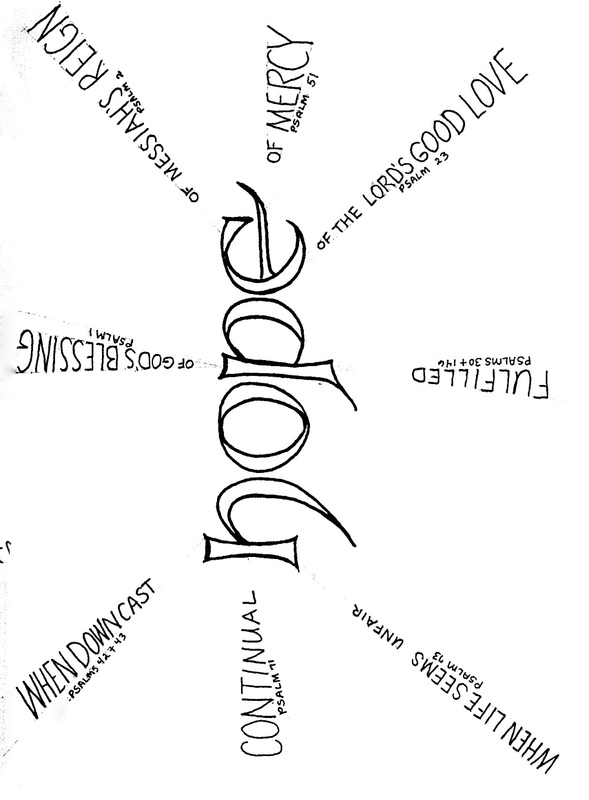 The first project was to take the word HOPE and then do "beams" out from it with the Psalm number and the Chapter title. We added color to it with watercolor, colored pencils or Gelatos®....doing our own thing. 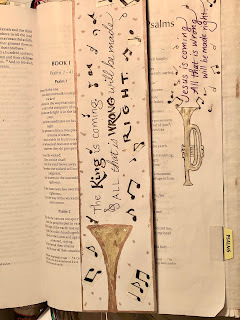 Each month we will add short notes next to the title of the chapter we are studying. The second project was done in notebooks or Bible. 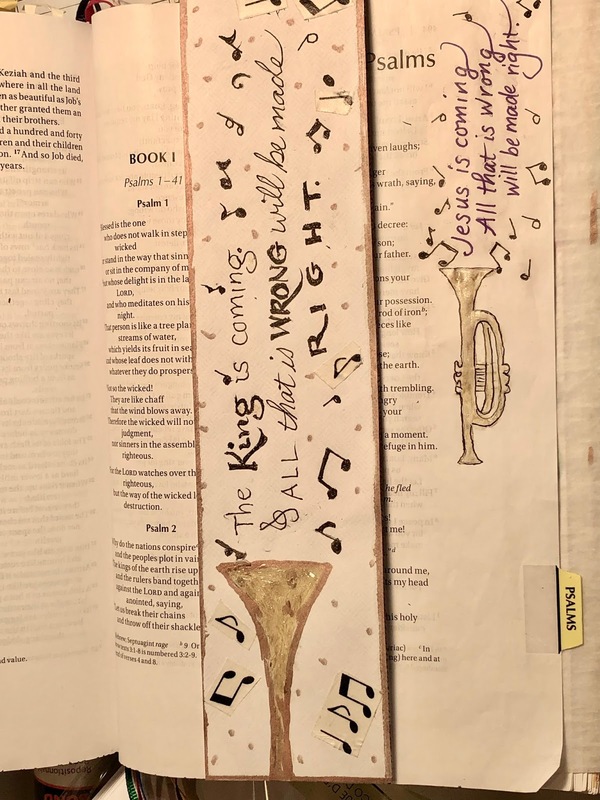 Using a trumpet sketch or trace, participants added music notes and the words, "The King is coming (or Jesus is coming). What was wrong will be made right." as if they are coming out of the trumpet. We used Micron® pens, gold leaf pens, colored pencils or Gelatos® to embellish. 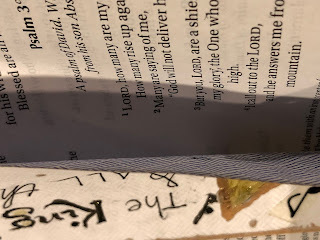 The image below shows an example in the Bible margin as well as a technique I designed awhile ago using a #10 envelope. Seal the envelope and cut it in half lengthwise, then trim the closed edges of each piece so that it is open on the long sides. Embellish as you like, then slip it over the page of your Bible which the design references. You can do the back of the envelope wrap when you are studying the page that it covers. These can also be used as bookmarks if they don't fit over your page. No worry about "bleed-through" of art materials when you are working on these flaps.